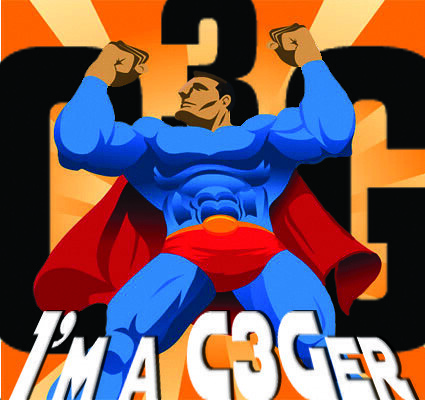 I'm A C3Ger!! - TORNADO is Going to GENCON!! Share your super experience. In a hundred words or less tell us, what drives you to play C3G Heroscape? What was your most exciting battle? Where do you play? Who do you play with? Tell us what makes you unique from other Heroscapers and/or fans of C3G. Basically, tell us whatever you want but you must end it with "I'm [Fill in your Name--Scaper Name or Real Name] and I'm a C3Ger." All submissions that are 100 words or less (The final line doesn't count toward your 100 word limit), are positive, and family friendly will be nominated for Heroscaper Community Vote. Heroscapers will choose their favorite submissions and the two highest vote getters will receive a prize. 2nd Place receives 4 personalized and unreleased C3G cards (in PDF form). Additionally, submissions may be featured in future C3G publications or other C3G promotions including social media outlets. You have until February 28th to make your submission within this thread. Remember it's "our universe, your experience." Vote Now! - Vote for your top 3. Just like voting for a Public Design. Updated Through: VOTING IS CLOSED! Last edited by Hellfire; March 12th, 2014 at 07:29 PM. Re: I'm A C3Ger!! - Submit Today! The need to contribute to this awesome website: that is what has driven me to chip in to this and other projects. Sure, I might not have an impressive Heroscape collection or someone to play with, but there is always online and solo-scape. While, I might not be the most strategically minded person, I try to stay determined (in other words, smack me around a lot. I might eventually learn) in order to help out. Hopefully, I can help improve others and other things, while also improving myself along the way. That is the reason why I'm [Ash] and I'm a C3G'er. A way to spend quality time together. That's one of the main reasons my girl and I play. Here C3G is a family affair I try and help the project, my girl plays the designs, and my cat tries to eat them. The time spent designing and teaching my girl the characters and my cat who not to hunt, also helps me stay on straighter path, and manage my high stress levels. That is the reason why I Chris, my girl Rachel, and my cat OG are C3G'ers. While we don't play nearly enough, C3G has allowed my younger sisters and I to bond through Heroscape. The complex cards are a little much for them, but they like playing with the female characters C3G has created (the Marvel master set is all boys!). One funny memory is when us three were playing a game in my room, and our mom came in, trying to get my sisters to do the dishes. She saw us playing together, everyone happy, and wisely decided to wait. C3G gets kids out of chores. What more do you need? I'm Logan and I'm a C3Ger. Why do I spend hundreds of hours playing, preparing, building maps, and expanding? Why do I spread the word to friends and others online? Why do I set aside 4 hours every Sunday to play a game of Heroscape with 3-5 of my friends? Why have my friends and I spent hundreds of dollars to add to the collection of over 300 figures, with tons of terrain? Why do I playtest, contribute to the community, and propose designs? C3G is worth every penny, every hour, and every amount of effort spent. Why? Because it’s the absolute ultimate superhero table-gaming experience. I'm Stephan, and I'm a C3Ger. I think the Heroscape rules set lends itself very well to superheroes, and the excellent designs of C3G bear this out. I have a sense of excitement playing with the characters that is better than I ever got from any superhero RPG. The existence of the Heroclix line was a perfect opportunity to expand upon the Marvel set. I enjoy the synergies of teams like the Fantastic Four, the X-men and the Avengers, many of which I own. I especially love the interactive terrain rules developed by Grishnakh which are wonderfully compatible with the C3G characters. I’m Nick and I’m a C3G3er. OP updated w/ links to the submissions. Heroscape is about the only thing me and my two room mates have in common. I'm an obsessive person so this game is the perfect hobby to obsess and scheme. Trying to create perfect armies is what it's all about for me. My luck is typically on the low side but still watching heroes and villains from the multiple universes clash into one another, watching underdogs win and champions fall, is what makes this game so appealing. Waiting for new updates is one of the most exciting parts. It keeps me scouring the forums as well as looking for new crazy synergy. I'm Arend, And i'm a C3Ger. I get more satisfaction from a playtest than most anything else. I feel like I'm contributing to a project much bigger than me, which I am. C3G also gives me an opportunity to bring my non-gaming friends into the excellent universe that is Heroscape. Many of my most cherished memories with loved ones were made over a board of interlocking hexes. I'm Chris Jones, and I'm a C3Ger. I'm not doing this for the prizes (obviously) but I thought it'd be fun to do this too. Who would win in a fight? Mighty Mouse or Superman? Those kind of questions are deep in the heart of many. C3G answers them and in amazing ways with tons of creativity to make varied and fantastic gameplay. So much fun! That's why I'm a C3Ger. Eagerly awaiting quozl's Mighty Mouse LD!